“‘The global imbalances have to add up to zero and so, if the US is going to be less the consumer importer of last resort, then other countries are going to need to be in different positions as well." Basically what we now have before us - as Pedro Solbes pointed out before being uncerimoniously defenestrated from the inner circle of the Spanish government - is an extremely complex situation and problem set. The background has evidentally been an unprecedented global financial and economic crisis, but this crisis has affected countries unequally, and it is noteworthy just how many people in what could be called the "weaker" countries have often sought refuge in the global nature of the crisis, rather than asking themselves just what it is exactly about their own particular economy that makes them "weaker", and more vulnerable, and why the crisis has struck more severely "here" rather than "there". Thus there is a great danger that people take refuge in the fact that the crisis is global in order to avoid thinking about the actual reality that faces them. This danger becomes even more of an issue as some countries begin timidly to return to growth, leaving others stuck in the mire - and possibly in danger of bringing the whole pack of cards tumbling down on top of them again. One such danger is evident in China (for which see the numerous warnings from Andy Xie) but others are for me somewhat nearer home, on Europe's periphery. A number of countries in Eastern Europe immediately come to mind - not only the Baltics, but also Russia, Ukraine, Bulgaria, Romania, Hungary, Serbia and Croatia. And in Southern Europe Spain and Greece stand out as in particular need of what Jean Claude Trichet would undoubtedly call "extreme vigilance". So the central point I wish to make is that all these countries now need to run current account and trade surpluses to generate headline economic growth and to start paying down the external debt they accumulated during the heady years of the boom. Countries are no different to households in this sense. 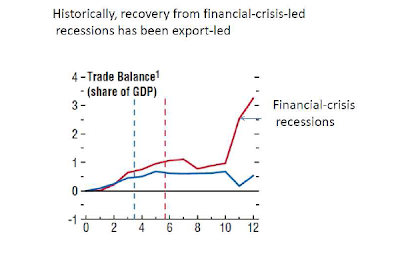 And the wider the current account deficit at the height of the boom, the bigger the correction needed. Without the much needed correction these countries simply will not recover, and we will see the famous "L" shaped recovery. If people think otherwise they are simply deluding themselves. The situation in the US and the UK is, of course, not that different structurally from that which is to be found in some parts of Eastern and Southern Europe, but it is less extreme, in that the Current Account deficit peaked at between 5% & 6% of GDP. This is still large, and correcting it is going to be one of the very good reasons that the global economiy ISN'T going to return to any kind of strong growth anytime soon, given the strategic importance of the economies concerned. Which brings us to Southern Europe. Italy is a case apart - since it is "simply" suffering from a kind of ageing-related terminal slow death "Venice style", and thus has a different problem set - in particular, while the Italian government is heavily in debt, Italian households are strong net savers, and thus any eventual default would be largely a "home team" issue. Portugal, Greece and Spain, on the other hand, were all running large CA deficits between 2000 and 2008, and these are deficits are now being forceably closed. But of course, and here comes the rub, these countries don't have their own currency - they have to issue debt in euros, and they can't simply fuel inflation (like they did in the past) since they can't print money, only the ECB can do that, and the ECB is a multi-national not a national institution. Take Spain for example - Spain's external debt is continuing to rising even as I write, while at the same time GDP is falling, and will continue to fall untill we get back to export competitiveness. Worse, nominal GDP (that is current price GDP) is now falling faster than real (inflation-adjusted) GDP, so the value of the debt remains - in money terms - where it is, while GDP shrinks in relation to this absolute reference point - both in real terms, and even more so in nominal terms. I have been following this problem in Japan for the best part of a decade now, and the solution is evidently not an easy one, since - if you take the core core price index - Japan never really came out of deflation after 1998, and land prices are now back at the levels of somewhere in the early 1980s. Needless to say, if this repeats itself in Spain, the mess will not be a pretty one, and the problem for the ENTIRE global financial system will be substantial, due to the counterparty risk element. So we are really caught on the horns of a dilema here, Spain and other EU periphery countries have to deflate (willingly or unwillingly, they need to carry out what has now come to be known as "internal devaluation") but so long as they fail to do this and to attract sufficient investment for new export industries to turn the economic dynamic around AND as long the rest of the global economy doesn't recover strongly enough with some countries starting to shoulder significant deficits again, then we are all only going to plumb the bottom. Worse, unemployment will continue to mount, and bad debts pressurise the banking system, which is where the next shoe might then not only drop, but be forced right off the foot first. The only way in which it would be possible for these countries to attract the necessary investment to be able to start to create employment employment again would be to restore competitiveness, and over the time horizon we should be thinking about this is impossible for them to do via productivity improvements alone: hence the pressing urgency for the "internal devaluation" solution. And let's not be fooling ourselves here - the main reason those famous government bond "spreads" have all tightened so impressively recently has been the willingness of the ECB to discount the national government bonds which are first purchased by local financial entities and then passed on for discounting at the ECB - a practice one of my Spanish friends calls the "truco del almendruco" (that is, you sell the 10,000 euro new car for 9,995 euros thus changing the key headline digit, giving everyone the impression there has been a large and significant discount, and, oh yes, first of all you need to dump a wheelbarrow load of cash on the banks - in this case on a one year financing basis). "Between October 2008 and April 2009 MFIs’ net purchases of debt securities issued by the euro area general government sector totalled €217 billion in the context of rapidly declining short-term interest rates. This entirely reversed the net sales of €191 billion observed between December 2005 and September 2008 in the context of rising short-term interest rates." As households and companies desperately try to save, to put some sort of order back into their balance sheets, government steps in (Krugman's push button "G") to help ease the transition. Such a policy is, of course, all well and good and totally justified (since there is effectively no alternative), so long as the structural transition which such support is meant to facilitate is actually carried through. And this is a big if, especially since most of the evidence we have seen to date suggests it isn't. And then there is the Irish case, and the proposal to create a "bad bank" (NAMA). According to Minister of Finance Brian Lenihan the Irish State plan to buy up toxic property loans with a current face value of €60 billion and investment property loans with a book value of €30 billion, all in exchange for Government bonds. 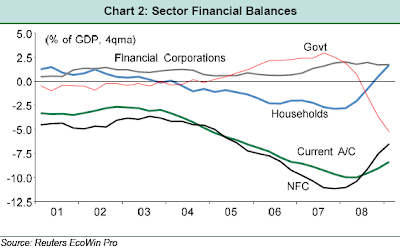 And how will the Irish government finance a possible €90 billion (or two thirds of 2008 GDP) in bonds? We the government plans to pay the banks in bonds which they can then redeem for cash over at the ECB. Obviosuly there is little other way, with such a high proportion of GDP, but has anyone started to think what will happen if the Spanish exchequer is faced with an equivalent proportional sum to clean up bad loans in Spanish banks. Spain, remember is the only major country where there was a property bubble where the banks have not had a substantial capital injection. And in my humble opinion the ECB will only be willing and able to continue with this kind of policy for a limited period of time, since they will not be in a position to keep accumulating Irish, Austrian and Southern European bonds ad infinitum, and the sovereign governments won't be able to keep increasing their debt load for ever. 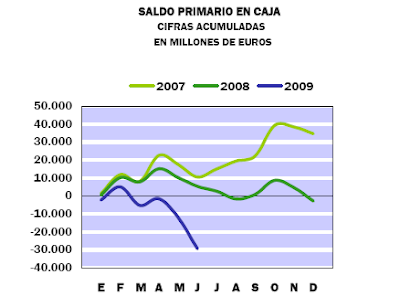 Just look, for example at the kind of dynamic Spanish public finances have entered in 2009 (see the acceleration in the cash basis deficit shown for 2009 in the chart below - the evolution is almost exponential, and it still hasn't stopped the haemorrage of jobs out of the economy). Maybe one day all those phones will be ringing, only for the caller to hear that old Elvis automated operator resonse - "no such number, no such zone". So, coming back to where we started, growth in Germany and France. Such growth is unlikely to be anything like as strong as most commentators and analysts seem to be expecting. France will most likely do rather better than Germany, given that the German economy can't really move forward till other key economies move, due to export dependence. The German economy may well even ultimately contract over 2009 as a whole by more than the Spanish economy, and I expect Germany's problems (like Japan's) to continue well into 2010, simply because both these countries are now very high median age societies which are completely dependent on exports to grow - which means that now that the UK, US, Eastern and Southern Europe are no longer running current account deficits, Germany and Japan are very hard pressed to get the level of trade surplus they so badly need for achieving sustainable headling GDP growth, which brings us back to Krugman's joke about which planet is going to do the importing? Structurally the previous drivers of growth will now fail to work, since as Krugman suggests, all the former CA deficit countries now need to export and run trade surpluses to grow and straighten out their financial imbalances , and it is not clear which countries can buy all the added output, especially when countries in general are still reducing imports, and certainly not about to open up deficits which would soak up all those new surpluses. The problem is that I think we are still some years away from being able to get any sort of agreement on such a programme - as everyone will have noted the G20 isn't really talking about this yet, although I think they eventually will. In the meantime we all have to stagger forward. And it is the risk of further "events" occuring in countries like Latvia and Spain that make all this staggering onwards and downwards ever so dangerous. 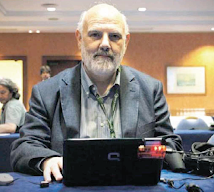 In all the key countries involved - the Baltics, Bulgaria, Romania and Hungary in the East, and Portugal, Greece and Spain in the South - government support is simply not sufficient to arrest the contraction in Krugman terminology simply hitting the "G" button will not work, and these economies are steadily "imploding" in on themselves, with the result, as I keep stressing, that unemployment inexorably rises, and bad debts simply mount up in the banking system, and if nothing is done to change course the outcome is surely a foregone conclusion.